The Governess is back with a new series of Britain’s Brightest Family, and it looks like there have been enough changes to warrant a new discussion post, not least a change in prize – the ultimate tournament winners now take £25,000 home, a change in set (out go the raising armchairs, in comes a large video wall) and a slight change in format with a new memory round. Better than the first series? Let us know what you think in the comments. Thank God they’ve got rid of those chairs. Never added anything to the format. Except it maked the show unique. Now it’s like all other quiz shows. #tippingpoint #PMQs are the 2 top trends. How very apt. I thought it was stupid that the doubler doubled everything except the jackpot and this shows why changing it was a good addition. I’ll be billing Hugh Rycroft for my format advisory in due course. Bit of a weird one though when Ben always mentions during the trade nothing else in the machine except the JACKPOT counter is of any value! It’s not as weird as ‘the doubler doubles everything on a drop… except this one thing.’ Double zero is still zero. They’ve made some decent changes to BBF – it’s almost a completely different format – like 5 Gold Rings I’m not sure it’s going to lead to bigger audiences who have already made their mind up, but I think it’s a better show. Buzzing in for a teammate has completely gone, the kid only has to nominate who takes on the Specialist and Memory Rounds, both on whizzy props. They’ve made the puzzles legible by making them full screen (thank goodness). Least successful round is multiple choice I think, the reveals are ponderous, whoever thought red on orange was a good idea needs a good talking to, and I think I’d throw in a 5 point bonus if a family gets a clean sweep. Also reckon 10 seconds is a bit hard to memorise ten symbols. Winning families now win a grand and progress to the next round of the tournament, they made very sure we were aware what the top prize was every five minutes it felt like. Anne’s more comfortable I think. It’s a decently entertaining half hour that’s not a must watch. Also should have been retitled The Hegs Factor, obv. 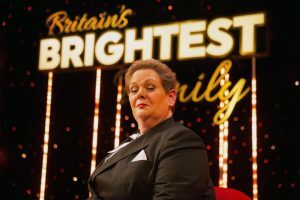 And in other Anne Hegerty news, she’s already booked up practically a year in advance for Pant-Oh! at Middlesbrough Theatre, barely 300 netres away from me as I type. She’s quite a big star for really quite a small theatre, but hopefully they can make it work. I reckon that every UK Chaser except Shaun Wallace has done at least one season of panto now. (Jenny Ryan has even done the exact same role as the one Anne will be playing.) Come on, Shaun! Britain’s Brightest Family reminds me of the BBCtv programme Ask The Family.